Once the composition was ready, I needed to render it as a sequence of images. I’d then use an external tool such as FFMPEG to encode the H.264 out of them, with a second encoding pass to mix the video track with audio. Only then I could either view it using Virtual Desktop on my Oculus DK2 or transfer it to my phone or tablet and use Google Cardboard viewer. Yesterday, Mettle released a brand new plugin named SkyBox VR Player. The plugin integrates with Adobe After Effects, Premiere and SpeedGrade and allows you to view your 360 content directly in Oculus Rift – without rendering! It will even let you work on your software without taking the HMD off, and automatically recognizes mono and stereo 360 compositions. Best of all: It’s free! Get it now from http://www.mettle.com/product/skybox-vr-player/ or read on for my first impressions review. SkyBox VR Player builds on the legacy of SkyBox and SkyBox Studio, solidifying Mettle’s position as a go-to source for VR authoring plugins for any Creative Cloud user. It uses Adobe’s own Mercury Transmit technology – the same one you may use to make your software “talk” to an external preview monitor, or a camera. Once activated, it creates a small controller window, allowing you to set up some of the basic preferences and behaviors. You will be able to either work in your application while wearing Oculus Rift in Workspace Mode (functionality similar to that of Virtual Desktop), or preview the content you are authoring directly 360 Mode. You can even set up a hot corner that will enable the 360 Mode whenever you move your cursor into pre-defined position. 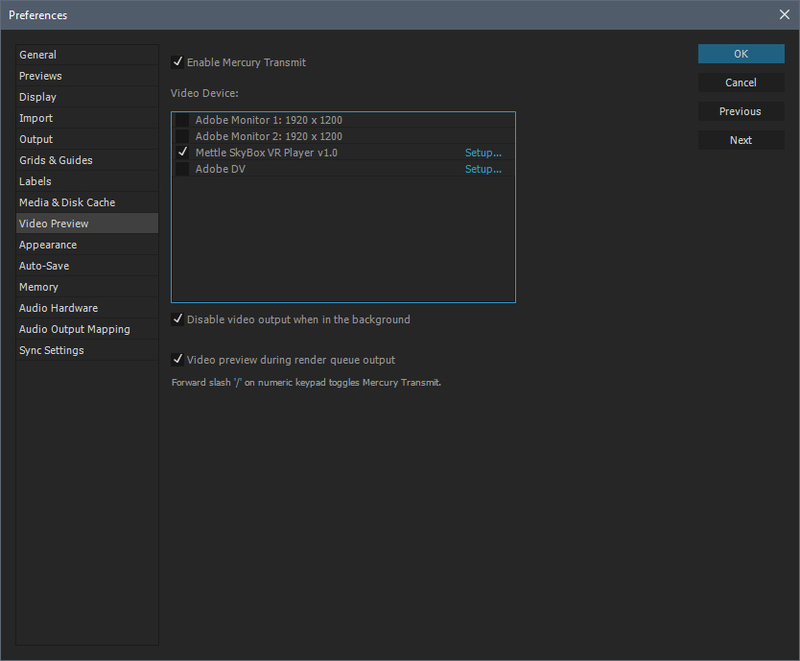 Myself for example – I will often keep the HMD on my face while working in AE, and go in and out of the 360 preview by moving mouse to the top-left corner of my monitor. You can also set the size of your workspace to fine-tune the sweet spot between UI being large and legible while not having to turn your head too much. For me it works best at around 100cm – but this accounts for a double monitor setup. Once set, you simply start working. 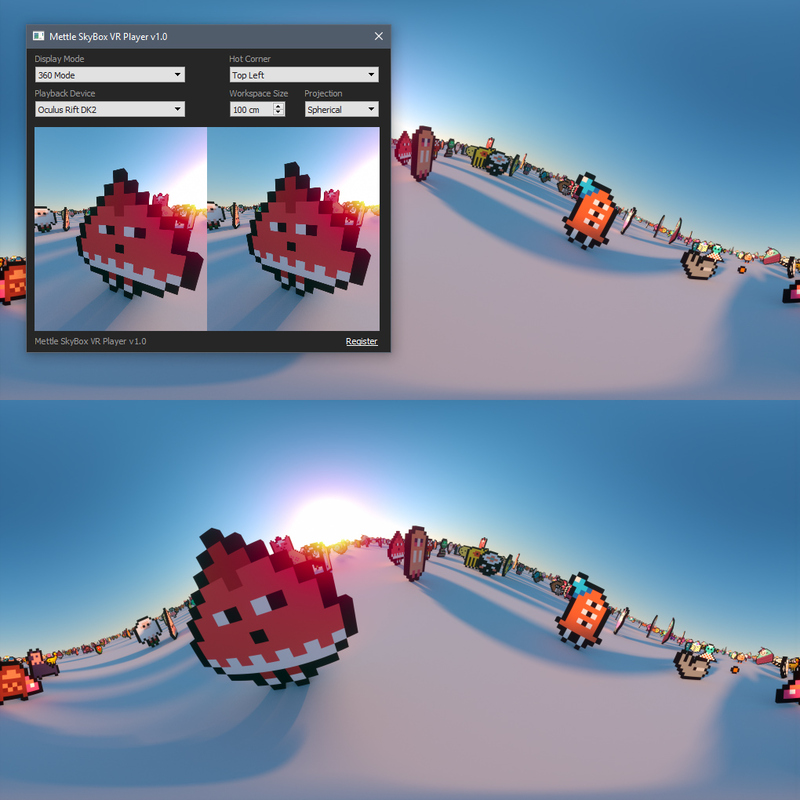 The SkyBox VR Player will interpret your content based on the composition sizes: Any comp with a 2:1 aspect ratio will be automatically fed to Oculus as a monoscopic 360 (creating identical image for both eyes). Compositions with 1:1 aspect will be understood as stereoscopic in a top-bottom configuration. At the moment the plugin does not recognize 4:1 comps as stereoscopic left-right – something I hope so see in future versions, since Octane Render 2 tends to output stereo in this format. All in all, SkyBox VR Player is pretty much a must-have for anyone interested in authoring VR in Adobe Software. At the bargain price of free, it is a no-brainer to pick it up if you have an Oculus Rift hooked up to the system. Now, how about somebody do the same for Cinema 4D? While writing this article I got in touch with Chris Bobotis, the Creative Director at Mettle with questions about current and future functionality of SkyBox. After posting the review I have also received free access to a number of published and unpublished/beta products by Mettle. While the relation with Mettle did not affect my impressions of SkyBox VR Player and in fact was a result of the review and not vice-versa, I just wanted to be fully transparent about it for the sake of journalistic integrity.